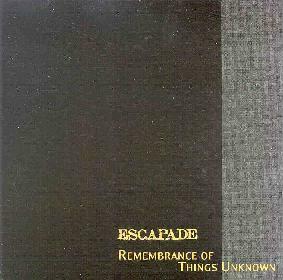 Escapade - "Remembrance Of Things Unknown"
Escapade's newest release is a collection of unissued live and rehearsal room tracks recorded between 1996-1998. The six songs are well chosen as they represent both the overtly space Kosmiche side of the band as well as their more general avant-rock leanings. And, of course, all the music is improvised, or, as the band like to say, "composed collectively and spontaneously". "Maelstrom Machine" and "When Whenever Comes" are the two major space/kosmiche tunes on the disc. "Maelstrom Machine" opens slowly with mucho wah'd guitar, pounding drums, and a searing sonic backdrop. The bass soon joins and along with the drums makes a steady driving rhythm section that keeps the pace moving as the band builds intensity throughout. This is wonderfully reminiscent of the best of Amon Düül II and other similar instrumental space explorers. "When Whenever Comes" is also a freeform kosmiche freakout, though it has a jazzier feel, and has that sense of having been composed that so much of Escapade's music communicates to me. Either way, this sucker jams hard, the guitar giving the music the jazz element, the synths swirling in a cosmic haze, and the reliable rhythm section steering a steady course. "Flat Fair", "Squelch", and "Crawlspace" all feature the more avant-rock side of the band. On "Flat Fair" we hear what sounds like "prepared" guitar and prominent drumming on what could be a table-top. There's something of a dance feel to the rhythms, but the music also includes some of the most completely spaced out synths I've heard from the band yet. It's an odd contrast between the synths and rhythm section but after several listens I've decided I like it for being so strangely freaky and it genuinely seems to work. "Squelch" sounds to my ears like a trippier version of Fred Frith's Gravity or Speechless albums. The guitar itself is very similar, as are the rhythms which are really trademark Escapade. This is a chaotic but controlled head bopper of a tune that I've really grown to like and illustrates the band's capacity for many forms of improvisational music, both in the space and general avant-rock realms. "Crawlspace" strikes me as sounding like a sort of avant-garde theater piece. There are loads of varied sounds, crashes, and bangs, and it has an echoed sound that embellishes the atmosphere nicely. But it doesn't quite evolve as smoothly as the other tracks. Finally, "A Useful Obsession" consists of 20 minutes of classic Escapade with pounding rhythms that set the pace for a primordial soup jam of various synth and guitars. The music has a mechanical machine-shop feel, is somewhat tribal in parts, and also includes those freaky Fred Frith type guitar sounds that I dig so much in their music. But like most longer Escapade tracks there are quieter spacey ambient segments, and on this track they have a gorgeous flowing space and jazzy quality that smoothly mixes both the spacey Krautrock and avant-rock sides of the band. In summary, this is a solid set of tracks from the Escapade archives. And due to the varied sides of the band represented I'd say this is a great place for the uninitiated to get their feet wet. But also note that this is a numbered limited edition of 500 so move fast before they're gone. "Remembrance Of Things Unknown" of distributed by Mother West. You can visit their web site. Contact via snail mail at Mother West; 132 W. 26th St; New York, NY 10001.